Unique modern bathroom accessories. The trixy acrylic bath accessories resist breaking and will add a splash of color to any bathroom. All the pieces have a modern tapered design. Tumbler: Tapered design with the same color inside and out is great as a tumbler or toothbrush holder. Soap Dispenser: Durable shiny chrome pump head attaches to the tapered of the soap dispenser. Soap Dish: This rectangular dish shown has a solid color on all sides of the dish. 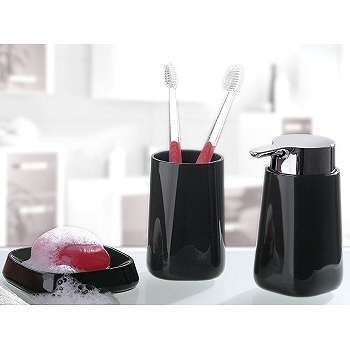 Toilet Brush Set: The toilet brush set continues with the tapered modern design. The brush head is hidden inside with a shiny chrome handle. Black: Just stunning. High gloss black acrylic finish. Ruby Red: Bright fire engine red bath accessory with shiny finish. Orange: Very bright orange with high gloss finish. The same color is on the inside and outside of this design. Green Apple: Bright granny smith apple color. The finish is high gloss and the acrylic material is great for the bath and resists breaking if dropped. Marine Blue: Stunning blue tone with high gloss finish. Snow White: Simply elegant bright shiny white. Taupe: Deep elegant taupe brown.